Everyone seems to have different ideas about custards! I always liked them as a child, but as an adult I can't handle the "eggy" part. Still, they look pretty cool! I was thinking the same thing about pastry cream.. Isn't it weird how baking makes it so flan-like? At least yours look so cute in the ramekins and unmolded nicely! Too bad you didn't really like them!! I think they look pretty good! I totally agree with you..I'd much rather make/eat pastry cream for the calories. This was super easy, I just wish the result was better so I could use this as an easy weeknight dessert. 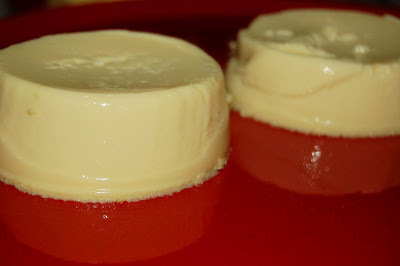 Love your photo of the unmolded custards! No real love here, but I'm glad I made it and tried it! They do look nice though! I skipped this one, but when I was thinking of making it I thought I would use a crust, too. Looks good, though. I like the pic showing the texture! I'm with you -- not worth the calories. But they were fun to try, and like you said, there is no real huge investment of time or ingredients. You have a lemon tree in your backyard? Sigh. Well, love them or not, you made the custards look beautiful, just like you always do! Oh...that must be so wonderful to have lemon trees in your back yard. I want a lemon tree! That would drive my husband crazy. He has a "thing" about lemons... it's a love/hate relationship with lemons. Go forth and make pastry cream! Cant' wait to see what you do with that. I love that you show the texture in you photo. Of course it is not a dessert I would choose by looking at it. :) But, that is where all of the opinions came in right? Mmm, pastry cream, now that sounds delicious! I'm sorry this dessert didn't have the "wow" factor. But at least your lemon and vanilla seemed to help out a bit! That and your custards didn't overbake!! They look quite pretty. But at the end of the day, I'm with your mom and husband. Give me a crust or some caramel or something with a bit of "jazz"! Perfect, delicious, and look so smooth and creamy. I love the idea of having a lemony sauce to go with it, but not as much as I love the idea of having my very own lemon tree! I would KILL for a lemon tree. Wow. Lucky you! You are amazing Anne Strawberry ! 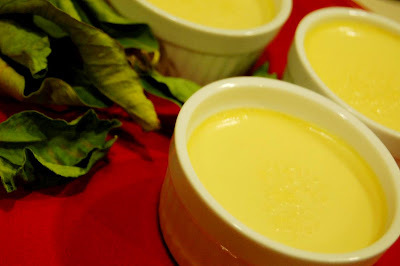 I like that you unmolded yur custards. They do look like flans. They look tasty. Yes, these little custards were a controversial item. Your custards look great. I really enjoyed this dessert for its simpleness... the caramel sauce sounds like a great idea though. A lot of people seem to be lukewarm about these. I guess I'm glad I couldn't fit them into the schedule! Yours look great, though. Come to think of it, I used to make an "impossible custard pie" that was basically a baked custard with a really thin, nice crust to it. Thanks for the reminder! I could definitely go for some pastry cream now that you've mentioned it! Great job this week! I hear you...if I am going to make and eat this, it had better be worth the calories and I just didn't think it was either. "Vanilla junkie" -- love that...I hear you on that, too! Yours looked very beautiful. Oooh pastry cream is just delicious - now you've got me thinking about it. I know hubs doesn't eat chocolate. Anyway, I do remember eating custard pie all the time as a kid. It was good with pastry. That may be the ticket for this little humble dessert. I like that it is low in sugar, has protein, simple and inexpensive to make. Great photos! I do the same mental weighing of the calories thing! I HATE it when something is "not worth the calories! I always think these look delicious, but for some reason I am never a fan. Still look good though!! I like how you took yours out, looks more like flan that way! I thought the mocha combo with cinnamon I used work great. I liked this easy and inexpensive recipe. I wanted to add mine to mini tarts, but they did not come together well, so I abandoned the project. Job well done. mmm! These look so good! just what I'm in the mood for right now!